Ben & Jerry's Chocolate Fudge Brownie Ice Cream Tub. Chocolate ice cream with chocolate brownie pieces. We operate on a three-part mission that aims to create linked prosperity for everyone that?s connected to our business: suppliers, employees, farmers, franchisees, customers, and neighbours alike. Includes Fairtrade certified cocoa, sugar, and vanilla. Kosher certified dairy. Ben & Jerry?s uses responsibly sourced packaging. Fudgy chunks of brownie goodness mixed into dark and rich chocolate ice cream. Sounds like a dream. At first, that?s all it was. Long ago, we were making brownie ice cream sandwiches for sale in grocery stores. Sometimes there would be broken pieces in the brownie delivery, and we?d nab them for flavour experiments. What would brownie pieces taste like in chocolate ice cream? Pretty good, as it turns out! 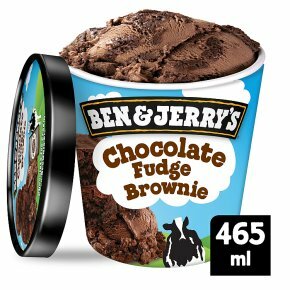 That original experimental flavour eventually became the legendary ice cream concoction known as Chocolate Fudge Brownie. Meanwhile, Ben Cohen had met Bernie Glassman, the founder of Greyston Bakery, a Yonkers, New York, USA-based company with a mission to end poverty and give back to the community. Equally important, their brownies were just so darn good?after sampling some, Ben handwrote a note asking for two truckloads of brownie pieces. While we knew Greyston would be the ideal supplier for turning Chocolate Fudge Brownie into a flavour sold by the tub, getting the brownies to cooperate wasn?t easy. After about 25 batches of brownies and six months of work, the flavour finally debuted in 1991, and it?s been a hit ever since. We work with Fairtrade certified producers for cocoa, sugar, and vanilla, and our Caring Dairy farmers produce the milk and cream in this tub in a sustainable way. Greyston Bakery, one of the largest social enterprises in the USA, continues to provide the brownies for this and all of our flavours. All of Ben & Jerry?s ice cream is made with cage-free eggs, and we use responsibly-sourced packaging.